RNAS Yeovilton celebrates its 75th Anniversary in 2015. This and a number of other themes will feature as part of this year’s highly anticipated International Air Day to be held on Saturday 11th July. The event as usual will host a feast of Naval flying alongside some of the best military and civilian displays from across Europe and beyond. The event was launched at the Fleet Air Arm Museum on 19th May. RNAS Yeovilton is currently a very busy place. “Transition” is a key word around the base as the UK modernises its fleet of military helicopters for all three services. Central to that change is a local company, AgustaWestland, which is based just the other side of Yeovil at its own airfield and factory complex. They are celebrating their centenary in 2015 and that will also feature strongly dueing Air Day. Over the last two years, the Maritime helicopter force based at Yeovilton has started to change over from the aging Lynx HMA8 to the all-new AgustaWestland Wildcat HMA2. This has seen 700W NAS (The squadron responsible for the in-service testing and development of the naval Wildcat) and 702 NAS ( The Lynx Operation Conversion Unit) disband and in their place 825 NAS has stood up as the first Wildcat Squadron. 815 NAS remains as the Royal Navy’s frontline Lynx HMA8 squadron supporting flights aboard the Royal Navy’s ships around the world. 2015 has also seen the Wildcat embarked aboard a ship for the first time on operations with a flight operating from HMS Lancaster in the Southern Atlantic . Alongside the Navy, the Army Air Corps has also recently moved into Yeovilton with the relocation of No 1 Regiment AAC from Germany to the Somerset base. They too are currently converting to the Wilcdcat with the introduction of the Wildcat AH1 variant. The Army sees their Wildcats as a completely new capability being a true ISTAR asset as a Battlefield Reconnaissance Helicopter. The camera mounted on the nose of the Wildcat AH1 is currently the best employed in the Army and is also capable of highlighting targets to other Helicopters and ground forces with a powerful laser. The next major change for Yeovilton started earlier this year with the recovery of 846 NAS to Yeovilton with six AgustaWestland Merlin HC3 helicopters . The Merlin will replace the famous Junglie Sea King HC4s over the course of the next year. The Merlin will also go through something of a change itself with the HC3 variants inherited from the Royal Air Force eventually being brought up to HC4 standard which will see several modifications for the naval role including folding rotors and tailbooms. All of Yeovilton’s current aircraft types will be on show at Air Day, mostly in the air as part of the Maritime Demonstration or the Commando Assault finale. On display at the Press Launch was the solo Wildcat HMA2 display from the Black Cats but expect to see the new pairs routine on Air Day itself. Though the Army Wildcat’s may not feature in the air display, they will have at least one Wildcat on static display alongside much of their in-field support equipment. Yeovilton’s sister station, RNAS Culdrose, will also be sending aircraft for the show. The Sea King HU.5 from 771 NAS will making its last appearance at Air Day before retirement with a search and rescue demonstration. On static display will be Avenger T1, Merlin HM2 and a Hawk T1. The major theme for Air Day is the station’s 75th Anniversary. Commissioned as HMS Heron on the 18th June 1940 the station has seen an amazing variety of types based there, many of which will be on the ground or in the air. Perhaps the standout aircraft will be the Royal Navy Historic Flight’s Fairey Swordfish I W5856. The aircraft has recently come out of extensive restoration and is now finished in the markings of 820 NAS during operations against the Bismarck. Its first post-restoration flight is expected imminently. Kennet Aviation will also be displaying their Seafire XVII, one of many produced by Westlands at Yeovil fitting both Yeovilton’s own anniversary as well as the Centenary of the Yeovil based aviation company. Completing the Second World War piston powered Yeovilton history is BAE Systems Avro XIX Anson. Yeovilton’s aircraft and personnel played an important role in the Korean War and the RNHF’s Sea Fury FB11 will be on static display. In the air, and making its UK public display debut, will be the Sea Fury’s adversary, the Mikoyan MiG-15 from the Royal Norwegian Air Force Historical Squadron. Yeovilton in the Cold War was a very exciting place. The Fleet Requirements and Air Direction Unit (FRADU) operated Canberras and Hunters in support of Royal Navy training and the Mid Air Squadron will present their Canberra PR9 and Hunter T7. Now based at Yeovilton, the de Havilland Sea Vixen will play a starring role during the flying while an example of its immediate replacement, the McDonnell Douglas F-4 Phantom FG1 will be static display. As mentioned about, 2015 also sees the Centenary of AgustaWestland and Air Day will be the official public event for this celebrations. AgustaWestland are working on bring together an impressive collection of their products for the show which includes a Agusta A109E from Boscombe Down plus German Navy Lynx Mk88A and Sea King Mk41A. The rest of the UK military will also be on show with the Red Arrows, Typhoon FGR4, Battle of Britain Memorial Flight Lancaster and Spitfire pair and the British Army’s Attack Helicopter Display Team with a pair of Apache AH1s. The international element of Air Day will be impressive. Already announced prior to the Press Launch were the Patrulla Aguila from the Spanish Air Force, the Royal Jordanian Falcons and a Czech Air Force SAAB JAS-39C Gripen in the flying display. On the ground will be a pair of Royal Norwegian Air Force F-16 Fighting Falcons and a Belgian Air Force NH Industries NH90. Also on static display will be the Textron AirLand Scorpion prototype making its second appearance in the UK after debuting at RIAT and Farnborough last year. However the big announcement for the Press Launch was an impressive contingent of aircraft from the French Navy. On the ground will be a Dassault Falcon 10MER, but the flying display will see role demonstrations from pairs of Dassault Rafale Ms and Dassault Super Etendards. Yeovilton may be the last chance for the British public to see examples of Super Etendards in the air as the type is due to be replaced by the Rafale soon. Another big “final” appearance will be that of Avro Vulcan B.Mk.2 XH558. XH558 has been an important part of Air Day since it made its first appearance in 2009 and all being well it will be a major highlight of the flying display again this year. After its flying display it will be parked close to crowd for underwing tours. Civilian displays will also in evidence. Making their début this year will be the newly formed Czech Mates Display Team flying a pair of beautiful Zlin 526 aircraft. They wear an exceptionally smart colour scheme and one of the team gave an impressive solo display during the Press Launch. As ever, Air Day is not just about aircraft and there will be some impressive ground shows. The Sporting Bears will be back again this year with an amazing selection of super and hyper cars. The Bears have recently topped the £1.4 million mark in their fund raising efforts for military charities which includes visits to events such as Air Day and the Rally for Heroes. The Royal Navy and supporting industry will provide many displays too and there will be arena displays from the Band of the HM Marines and the Field Gun Competition. Yeovilton look set to be an event not to be missed. Tickets are now onsale online from the Air Day website. 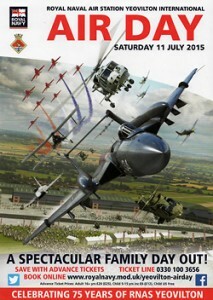 Flightline UK are also running a competition for three pairs of tickets to Air Day. Advance Ticket Prices: Adult £20, Child (5-15 yrs inc) £6, Child (Under 5) Free. On the Day Ticket Prices: Adult £25, Child (5-15 yrs inc) £12, Child (Under 5) Free.